Could it be that Val Guest is beginning to undergo a “rediscovery”? In a two month stretch (November 17 to January 20), three of his films were released on Blu-ray by three different companies – two American, one British. Two of these are key features in his filmography, the third a little-known work made the year after Guest launched the minor British studio Hammer Films on a two-decade run as one of the most influential producers of horror in the world. Back in November, the BFI released an excellent edition of Guest’s most prestigious production, The Day the Earth Caught Fire (1961), one of the finest science fiction films of its period. 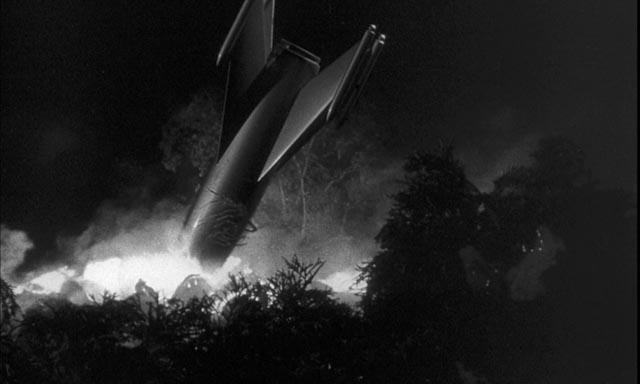 Just two weeks later, Kino Lorber brought out an almost equally fine edition of Hammer’s The Quatermass Xperiment (1955), and then in January Olive Films released a bare-bones disk of The Weapon (1956), the third of four films Guest made between The Quatermass Xperiment and its inevitable follow-up, Quatermass 2. The Quatermass Xperiment stands as one of the most significant and influential British films of the ’50s, although its identity as an unrepentant genre movie has shunted it to the edges of British film history, far from the reverence shown to the realist films which proliferated a few years later – films like Loneliness of the Long Distance Runner, Saturday Night and Sunday Morning, The Entertainer and This Sporting Life. What makes Guest’s film, adapted from Nigel Kneale’s renowned BBC serial, particularly notable is the sense of realism he brought to the fantastic subject, in both its observation of character and its attention to setting. This not only prefigured the kitchen-sink realism which characterized British cinema in the late ’50s and early ’60s – it also stands in contrast to the genre films being made in the States at the same time, which seldom made any effort to evoke this kind of realism. The simplest of Nigel Kneale’s Quatermass stories, Xperiment deals with events surrounding the first manned space flight. Of three men sent up, only one returns and he seems to be infected with some kind of alien life form which is gradually transforming him into an inhuman monster. Not a particularly radical narrative, but when compared to something like First Man Into Space (Robert Day, 1959), which borrows the main idea, it becomes apparent what makes Guest’s film stand out. It is rooted in a closely observed familiar world, with recognizable characters (Jack Warner’s matter-of-fact policeman, David King-Wood’s doctor) struggling to cope in plausible ways with the consequences of a new and unknown threat, while Richard Wordsworth gives a remarkable performance as Victor Carroon, the astronaut whose humanity is being devoured by that alien force, a performance every bit the equal of Karloff’s creature in James Whale’s Frankenstein (1931). Guest, who strove for a style which suggested a straightforward documentary of unusual events rather than any pulp flights of fantasy, manages to keep the story firmly grounded; in his hands, what could have been a crude monster show becomes something close to tragedy. As has been well documented, there were disagreements between Guest and original writer Kneale over elements of the adaptation. Kneale’s Professor Bernard Quatermass was a committed intellectual, a scientist who weighs the pursuit of knowledge against the practical risks of technological progress. 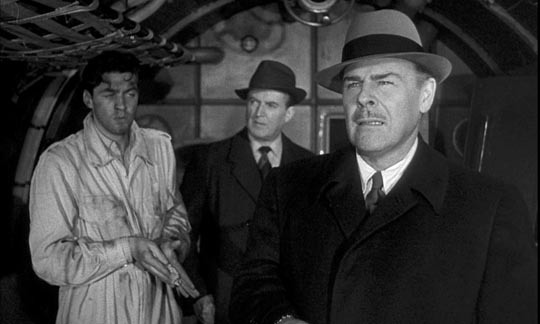 In compressing the three-hour original down to a tight 82 minutes, Guest and co-writer Richard Landau ramped up the narrative energy by turning Quatermass into something of an arrogant bully (played by a blustering Brian Donlevy, an actor Kneale had little respect for) who disregards the trauma wrought by his project. Kneale was entirely justified in his resentment about this fundamental change; but Guest was equally justified in making the change. The film is its own creature, based on but separate from the television serial. With less room for Kneale’s intellectual arguments, the film needed a different kind of energy to propel the story. 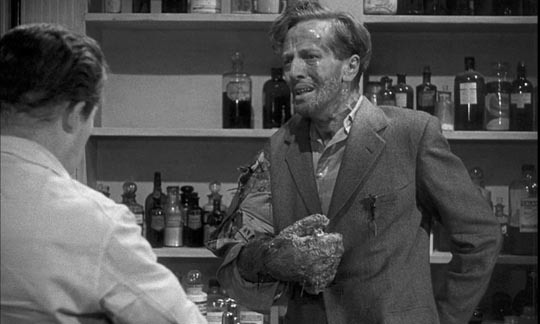 The same could be said of the sequel, the more complex Quatermass 2 (1957), which retains Guest’s concept of the character even though in this case he actually collaborated with Kneale on the script (Kneale and Guest also collaborated on another adaptation of a TV serial, The Abominable Snowman, later the same year). Kneale’s more intellectual conception of the character can be seen in Hammer’s third Quatermass adaptation, Quatermass and the Pit (Roy Ward Baker, 1967), the most complex of the stories and very different in tone from the two ’50s films. As good as Quatermass and the Pit is, it lacks Guest’s gritty sense of realism, and its elaboration of Kneale’s ideas about human history and the nature and origins of violence doesn’t have the visceral impact of the two earlier films. By the time it was made, science fiction was becoming a far more mainstream genre and there was more room to let the ideas take centre stage (it was released just five months before 2001: A Space Odyssey and three months before Planet of the Apes); back in the ’50s, Guest’s realism and narrative energy were necessary to overcome possible audience resistance to the fantastic elements of the first two stories. The extras on Kino’s Blu-ray aren’t as substantial as those on the BFI’s Day the Earth Caught Fire disk, but they do sketch in the history of the production and situate it in its original context. Guest turns up in both an on-camera interview and a commentary (both guided by film historian Marcus Hearn), and there are several featurettes about the making of the film. I have to confess that I was a bit irritated by the “introduction” by John Carpenter because of the history of his relationship with Nigel Kneale; admiring Kneale, Carpenter had hired him to write a script for Halloween 3, only to trash Kneale’s work when it was reworked by director Tommy Lee Wallace for Season of the Witch (1982). Carpenter later rubbed a bit of salt in that wound by attributing his script for Prince of Darkness (which crudely owes something to Kneale’s work) to “Martin Quatermass”, so hearing him speak a bit disdainfully here about Kneale’s more intellectual conception of Bernard Quatermass, asserting that Guest’s blustering bully is somehow a better character, is annoying. But what’s really important is that the disk presents an excellent transfer of The Quatermass Xperiment in its full British version; Guest’s seminal work is on display here to its best advantage and hopefully we’ll soon be seeing a Blu-ray of Quatermass 2. Although Val Guest had been directing films since 1943, the first Quatermass adaptation was a real breakthrough for him. And yet during the next decade, the period of his best work, he continued to make minor program fillers, musicals and comedies, in between his more substantial movies. The Weapon is one of these lesser efforts, a work for hire made for American producer Hal E. Chester and Republic Pictures. It was quite rare for Guest to work from a script which he hadn’t written, or at least co-written, himself. Chester started out as a writer and producer at the poverty row Monogram Pictures, and the most notable movies he was connected with in the ’50s are Ray Harryhausen’s Beast From 20,000 Fathoms (1953), the prison picture Crashout (1955), and Jacques Tourneur’s supernatural classic Curse of the Demon (1957). The script for The Weapon, which Chester co-wrote with Fred Freiberger (a prolific TV writer who would later be one of the producers on the original Star Trek series), begins with a promising set-up, but never fully develops the story’s potential and fails to take advantage of its setting in post-war London. While playing with his friends in some bombed-out ruins, eight-year-old Erik Jenner (Jon Whiteley) finds a gun sealed up in a wall. When he scuffles with another boy who wants it, the gun goes off. Believing he’s killed his friend, Jon runs away. 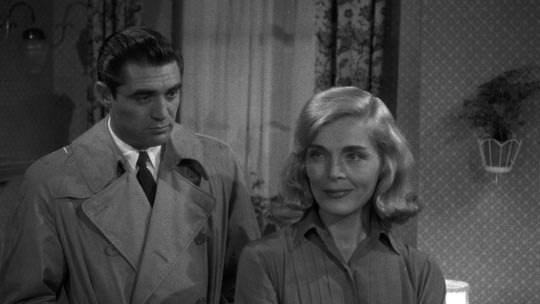 Naturally, his single mother Elsa (Lizabeth Scott) is distraught. But the police have an additional reason for finding the boy; it turns out that the gun was used ten years earlier, at the end of the war, to kill an American officer. Because of that connection, U.S. military investigator Mark Andrews (Steve Cochran) gets involved. He’s a tough guy who tramples on both protocol and other people’s feelings. Inevitably, he becomes attracted to Erik’s mum and his concern gradually shifts from finding the gun and the killer to saving the boy. While the film was shot on location in a London still damaged by the war, the script works against Guest’s attempts at any kind of realism. Chester and Freiberger pile ridiculous coincidence on top of even more ridiculous coincidence, with irritatingly clumsy plot contrivances and underdeveloped characters. Andrews’ anger and bitterness are left unexplained, Elsa’s backstory is almost entirely absent (Scott is so blatantly American that being the single mother of a very English boy in London raises questions never addressed). Herbert Marshall has little to do as the policeman who has to work with (and try to rein in) Andrews. Most ridiculously, George Cole is introduced quite early and since he is obviously the killer, his efforts to insinuate himself into the story and the lives of the other characters makes no sense; he’s remained hidden and untouched for ten years and there’s no obvious reason to believe that the police would ever link the gun back to him. The one bright spot in the movie is young Jon Whiteley, who had previously appeared in Charles Crichton’s Hunted (1952) with Dirk Bogarde, Philip Leacock’s The Little Kidnappers (1953) and Fritz Lang’s Moonfleet (1955). 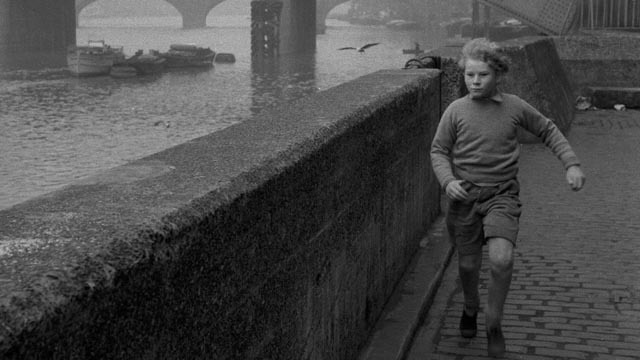 He was one of those natural child actors, devoid of cuteness and mannerisms, and his grim intensity as the frightened boy hiding out in the bleak city gives the film what emotional weight it has. Fearing that he has killed his friend, he avoids every attempt of the adults to find him, unaware that they’re really trying to help rather than punish him. 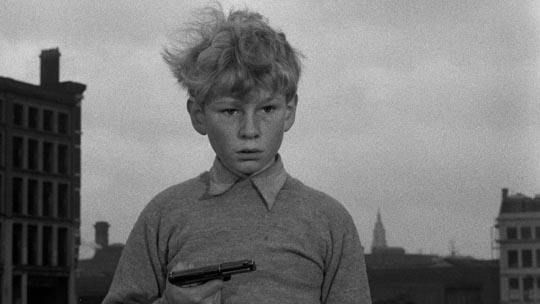 The Weapon had the potential to be something like Morris Engel’s The Little Fugitive (1953) with a gun, but the script all but shoves Erik aside in order to focus on Andrews and the mediocre “mystery” of the ten-year-old murder. The writers have very little feel for the English milieu and you get the impression that Guest doesn’t really know what to do with the American characters. The performances of Cochran and Scott are notably weak compared to those of the supporting cast and certainly not on a par with the performances evident in other films directed by Guest.